Heat sealers are used to seal a wide range of products from food, beverage, pharmaceutical and even hardware into plastic tubs or cups using direct contact heat. Heat sealing ensures that your product is tamper proof, leakage free and hygienic. Depending on the sealing film having a metalized layer, an added shelf life can be gained by adding a moisture and oxygen barrier. Heat sealing is common for applications where the sealing diameter is more than 50mm. Production where size changeover is limited are well suited to heat sealing. The other main application for heat sealing will be where the product has no lid or cover and the sealing film is what is relied upon to complete the package. The sealing material per unit is usually less than induction sealing material. Products can be sealed without a lid or cap. You can visually inspect each seal as there is no cap or lid covering the seal during the sealing process. Very low cost plastic seals (without a metal foil layer) can be used. This is a big advantage when the primary reasons for sealing do not include moisture and oxygen barrier requirements. Larger diameter jobs beyond 70mm will use a large amount of sealing material per item and hence the availability of lower cost sealing films becomes a more significant advantage for heat sealing. 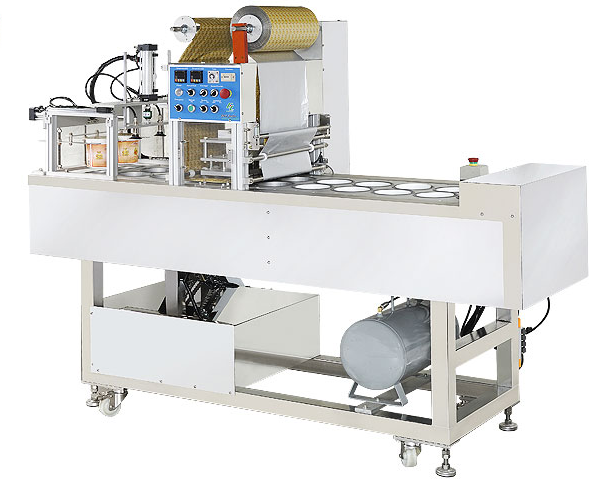 Our machines are custom built to customer’s specifications and requirements. Some applications include: cup water, juice, lunch box, jelly, pudding, bean curd, soy bean milk, fresh frozen food, cold / warm food, agricultural processed food, cosmetic and pharmaceutical products. For many kinds of packaging product by plastic or paper cup / box.